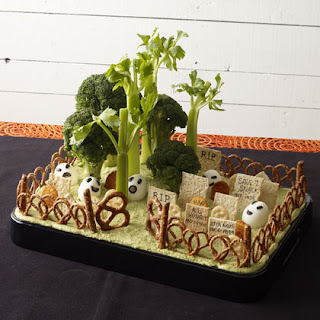 Joy De Vivre Design: Need Some Fun Ideas for Halloween Goodies? While looking for ideas for our Halloween party I ran across the Disney Family Fun website. Gosh, with all of these Disney mentions on my blog lately you would think I had gotten a job at the mouse's house! Anywho, I wanted to share these themed eats with you. They have two things that I like when I cook-easy to make and cute! 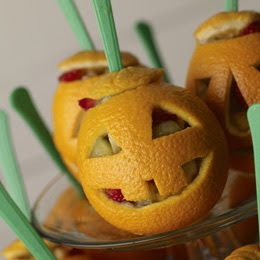 Snack o' Lantern will make your children want to eat their daily serving of fruit. It may take a few moments to carve out the oranges, but I think the final result is worth it. 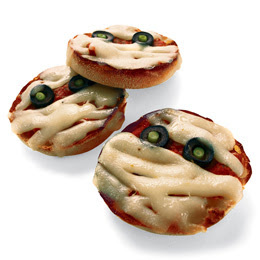 Pizza Mummies are made from English muffins, pizza sauce, olives and cheese. 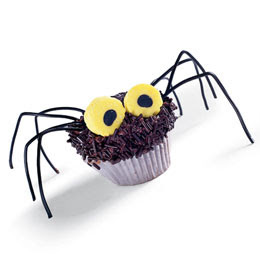 Hairy Daddy Longlegs Cupcakes puts a spin on the traditional cupcakes with just a few added ingredients, licorice and sprinkles. The Haunted Graveyard is definitely going to be on my menu for Halloween. Instead of hummus for the grass, though, I think I am going to get the hubby to make his awesome guacamole. What will all of you be doing for Halloween? Do tell! Great ideas! The "mummy pizza" is really clever. I love that one,too, Kay! I think the mummy pizza may be on the menu Saturday. Very cute ideas! I think I'll use the pizza mummy one too!